Super Savings Item! 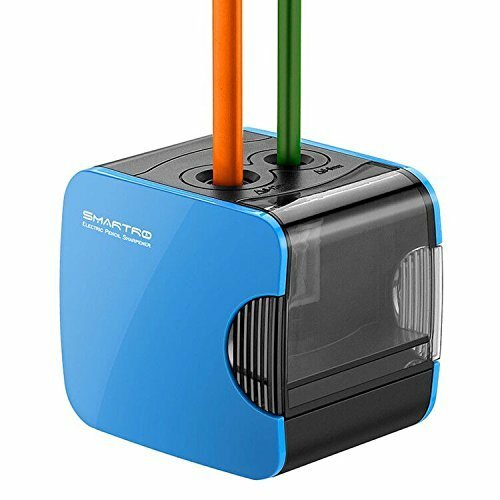 Save 40% on the SMARTRO Electric Pencil Sharpener, Best USB or Battery Operated for No.2 and Colored Pencil by SMARTRO at Stickman's Blog. MPN: SMTOO662018. Hurry! Limited time offer. Offer valid only while supplies last. DOUBLE HOLE DESIGN & SOLID: Powerful enough to sharpen every pencil to a perfect and durable point in only 3-5 seconds with ease, especially for No. 2 pencils & colored pencils. Two holes for 6-8mm and 9-12mm diameter pencils separately. KID-FRIENDLY: It won't operate if the cover is removed or is not installed correctly, which means that it won't hurt your kid's finger when he or she is using it in classroom. BEST USB OR BATTERY OPERATED: The sharpener is powered by a standard USB outlet, 4 AA batteries or adapter. To avoid the potential insecurity of plug-in for kids, the adapter is not included, but it is highly recommended that a 5V 2A adapter be used to get more strong power. If you have any questions about this product by SMARTRO, contact us by completing and submitting the form below. If you are looking for a specif part number, please include it with your message.